“Our students have changes radically. 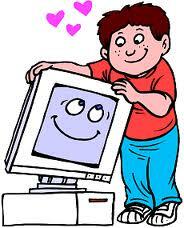 Today’s students are no longer the people our educational system was designed to teach” (Prensky, 2001p. 1). Today’s students, referred to as digital natives, are saturated with technology. I see babies in prams playing on their mum’s Iphone before they can learn to talk! The constant exposure and interaction with digital technology, through the use of computers, videogames, mobile phones and digital music players to name a few, has changed the way our new generation of students’ think and process information in the brain (Prensky, 2001). The use of technology during the early years of childhood has altered the brain structure to a different thinking pattern than any other generation (Prensky, 2001). Digital natives are used to receiving information at a fast rate, getting instant gratification, parallel processing and multi-tasking (Prensky, 2001). This means that children are looking for a different learning experience, one that is familiar to them, as opposed to the experience that pre-digital aged teachers, who are teaching them, have created (Prensky, 2001). 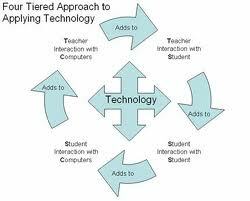 Hence the recent shift in education systems to incorporate ICT and other technologies in teaching and learning strategies across all Key Learning Areas (KLAs). This is reflected in the NSW syllabus in all KLA’s and also in the NSW Institute of Teachers’ Professional Teaching Element 4 – Aspect 4.1.5 Use a range of teaching strategies and resources including ICT and other technologies to foster interest and support learning. The explicit reference to ICT and other technologies in these mandatory documents means that teacher’s are now accountable for transforming their ‘old’ pedagogy of teaching, to one that is more current and engaging for today’s students, the digital natives. Teachers need to elevate the quality of learning through providing an environment that is relative to their students’ style of learning. Through the use of ICT and other technologies teachers can create meaningful and engaging learning experiences for their technology savvy students. 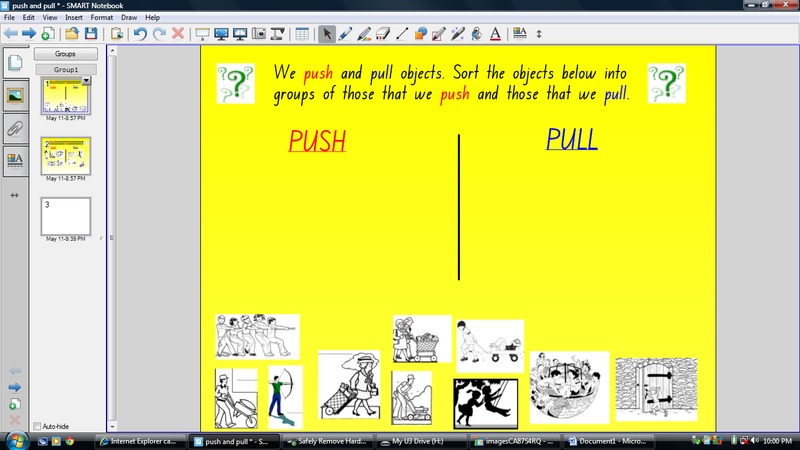 Below is my example of ICT being incorporated into a science lesson on ‘push and pull’. This Interactive White Board resource makes learning fun as they are able to use their kinesthetic skills to drag and drop items where they belong. 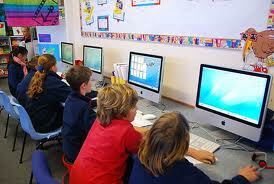 ICT allows learning to become interactive and engaging for the digital native students. During my school visits I observed how my school integrates ICT into their teaching. The school has been very proactive and devised an ICT skills scope and sequence for each stage, highlighting the curriculum links across all KLAs with ICT skills which teachers must incorporate in their teaching. 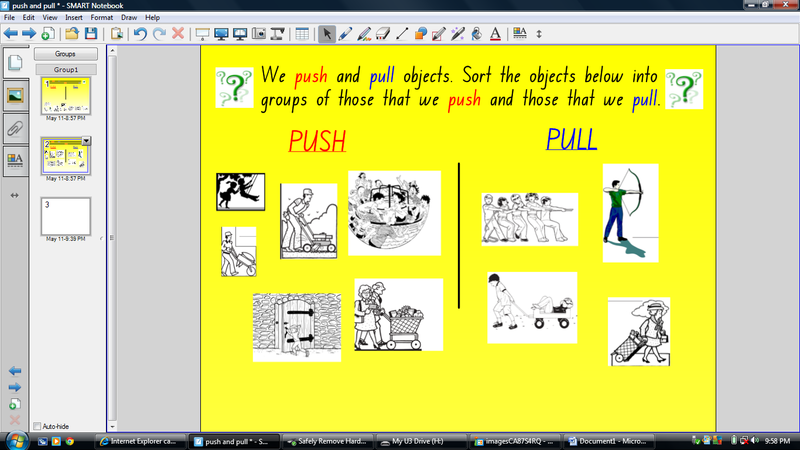 These outcomes have been set up and enforced by the school. In the year one class I am currently placed in, they incorporate ICT skills in their literacy program through PM readers (2 desktop computers are set up in their classroom for this), a daily activity on the Interactive White Board for students to display the date and weather and through incidentals such as, when the teacher was creating task group tags she asked the students to explain how to insert a picture into a Word document. They went through this procedure step by step. The school also has an E-Learning room, in which each class has time to use the computers for ICT skills learning and also to incorporate the use of computers into other KLA work. Each classroom has a Promethean Interactive Whiteboard, flip cameras and also access to a laptop portable library. The Year’s 5 and 6 in the school are engaged in project based learning. The rationale behind this is that studies have supported that students who learn in an environment that represents authentic real experiences are better learners and are more equipped for the workplace. The school has adopted this style of learning to engage students’ interest and motivation to learn; placing a huge emphasis on learning ICT skills and to enhance content meaning through the use of computers. One pitfall of using computers for the majority of school work is that teachers cannot completely assess the students’ spelling and grammar competency, as programs have tools to auto correct these. However, the school recognises that the use of technology is central for engaging students to learn content and the development of life skills a 21st century student needs in order to succeed. Students are instructed to work from 12pm till home time using ICT as a platform for their content learning of the KLAs. I had the privilege to watch film documentaries that Years 5 & 6 students made about education systems around the world. The school gave the students an unforgettable experience of going to film making courses at NIDA and AFTRS (Australian Film, Television and Radio Studios) to learn about how to make professional films. The students used programs such as Movie Maker and Photo Story to develop their documentaries and deliver a professional result. I was astounded by the quality and professionalism of their films. Teachers in all school’s need to approach ICT with “open arms” so that they allow their students to learn in a manner that complements the way their students’ think and process information. The use of ICT will enhance their learning experience, as the digital learning environment matches their way of learning. This in turn will make learning more engaging for this new generation of students and will increase the quality of their education. Today’s teachers need to embrace the way of the future of teaching. Prensky, M. (2001). Digital Natives, digital immigrants. On the Horizon. 9(5). 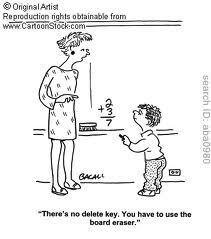 Classroom Behaviour Management: Theory or Practice?